I know what you must be thinking. 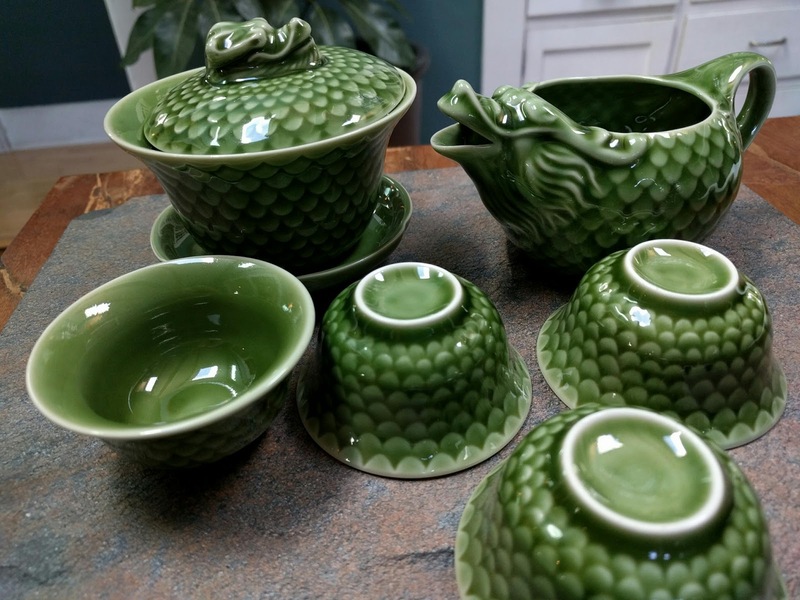 Despite appearances, I did not procure this tea set for the Game of Thrones finale. My husband had recently cracked my white porcelain gaiwan- his story is that I set a booby trap for him in the kitchen cabinet. When your most functional gaiwan is randomly felled by a steamer basket, there is only one way to go. Tea hoarders tend to overcompensate- where's the fun replacing like for like. I saw these wondrously weird slip cast beasts where else but on eBay. The trouble with my plain gaiwan was that it did not add any "feels" to a tea session. But when you have tea or water pouring out of a furry dragon's maw, it's all "feels". I probably would not drink out of a vessel with European dragon motifs- the gold hoarding virgin-abducting malignant man killer angle is a total buzzkill. But I am all for the Eastern dragon as a benevolent symbol of strength and wisdom. I actually use the cha hai for cooling down water for making matcha... matcha latte... but that is for another story.